Archos introduces the GamePad, a 7-inch Android 4.0 tablet with physical gaming buttons. The tablet features an unmentioned dual-core processor with a 1.5GHz clockspeed, combined with the Mali 400mp quad-core GPU. This gaming tablet is anticipated to hit the market in October for 150EUR (incl. VAT). 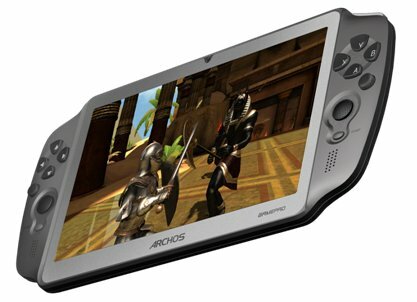 ARCHOS, an award-winning innovator in consumer electronics, announces its first gaming tablet today. This new type of tablet, the GamePad, combines gaming controls with Android for a full tablet and gaming experience in one. Gamers will not only have access to all their favourite games, they will also have access to email, Internet, apps and more through one device. The GamePad features a 7-inch, capacitive screen, physical control buttons and analogue sticks. The Google certified tablet has full access to Google Play for the tens of thousands of games available, runs a dual-core processor @ 1.5 GHz combined with a Mali 400mp quad-core GPU. In addition, the GamePad includes automatic game recognition and mapping tools - patented technology to ensure control compatibility with every advanced Android game. Until now, tablets provided gamers with touch controls that lacked response and compatibility, providing a disappointing gaming experience. As one of the main tablet uses, there is a strong need for a tablet that does more for gaming. Thanks to the complete touch and physical controls of the ARCHOS GamePad, Gamers can enhance their experience starting at the end of October 2012 for less than Â£130. Some leading game developers have already embraced the physical controller support that was introduced with ICS, rendering their apps compatible with the physical controls of the GamePad or with game controllers plugged into tablets or phones. However many games originally did not include physical control mapping, which is why ARCHOS developed their mapping and game recognition tool; a patented technology that allows any virtual controls to be mapped the GamePad's physical control buttons. "Thanks to the mapping and automatic game recognition systems included on the GamePad, we already have over a thousand android games compatible with the ARCHOS GamePad's physical controls, including back catalogue titles that originally didn't include physical controls," continued Crohas.